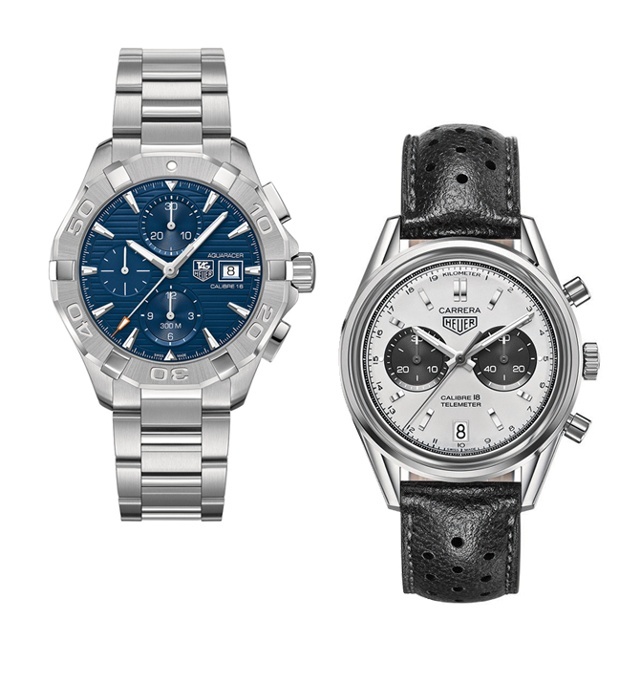 In addition to its vintage-sourced Carrera models (see below), new colorful Formula One chronographs and a new Aquaracer, TAG Heuer in 2015 announces an entirely new Carrera model in this backbone collection for the company: TAG Heuer Carrera - Heuer 01, featuring a movement developed from the Caliber 1887. Called the Heuer 01 in honor of company founder Edouard Heuer, the Heuer 01 is clearly identifiable as an in-house movement. 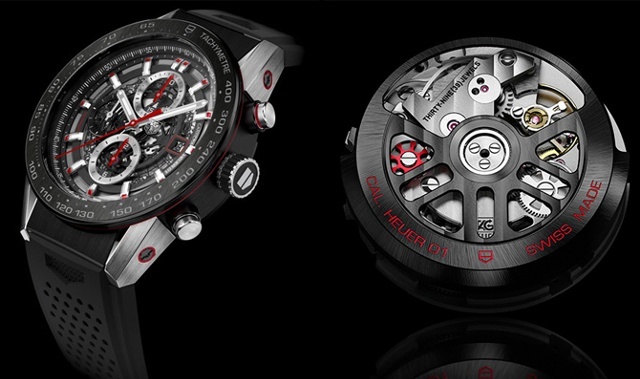 TAG Heuer has colored the caliber’s chronograph column wheel red, has skeletonized the chronograph bridge and has blackened and skeletonized the rotor. On the dial side of note the chronograph controls and the openworked date disc, both new sights on a TAG Heuer watch, particularly one bearing the Carrera moniker. Even the case is new. It is titanium but developed in a modular fashion using twelve different components rather than via TAG Heuer’s more traditional single-piece construction. The design opens up a wide range of possibilities that will be the source of designs in years ahead. Look for models developed from various combinations of materials, colors, treatments and finishes. Also at Baselworld, TAG Heuer references its long history as a supplier of racing timers. Look for two new Carrera models, each sporting a vintage look and the famed Heuer logo. The new pieces capture the heritage of Heuer and also feature what some may consider a vintage-sized case: 39mm. One piece is a three-hand Carrera Calibre 6, a COSC-certified silver and blue model with a touch of red on the flange’s 60, on its Heuer logo and on the seconds hand. It’s a colorful tribute to the original 1963-Carrera design. Its blue small second counter matches the blue vintage perforated leather strap. The Heuer logo on the clasp of the strap personifies the style. The silver, blue and red combination gives the watch a very retro-trendy look. The second model is the Carrera Calibre 18, an automatic chronograph that echoes Jack Heuer’s Carrera design with its dual-counters, just like the Heuer Carrera of the 1960s. It is not a standard chronograph as it boasts a telemeter scale on the flange that historically was used to measure the distance of artillery fire based on the speed of sound. Like the Calibre 6, the new model is branded Heuer with the vintage logo. The boxed glass crystal accentuates the vintage vibe of the piece. In addition, the firm’s new Aquaracer 300M collection sports a new bezel with six ergonomic studs that allow the wearer to more easily set it up when wearing gloves. The dials have a new horizontal streaking effect for an edgier look and luminescent markers on indexes and hands. Also added is a screw-in crown for more security and precision and a folding clasp with a double security clasp and a special diving extension The models will be offered in both strap and bracelet models. 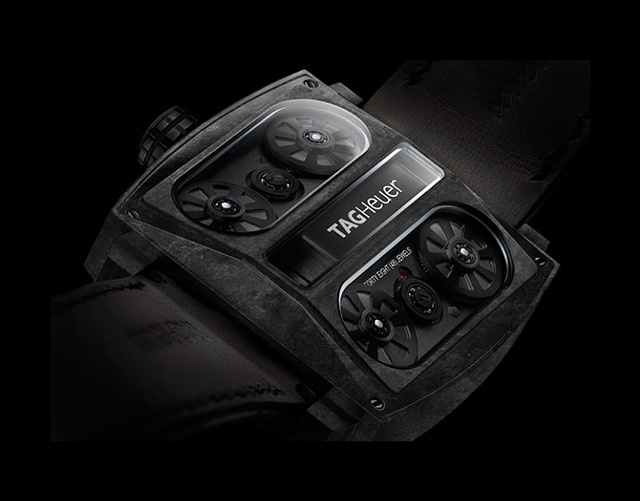 Also, TAG Heuer’s Monaco V4 is now blackened to create the V4 Phantom, which debuts an innovative case made entirely from Carbon Matrix Composite (CMC), as are the movement’s seven bridges. Finally, TAG Heuer, Google and Intel yesterday announced a partnership to launch a Swiss smartwatch powered by Intel technology and Android Wear. More details about this will be forthcoming in future reports.